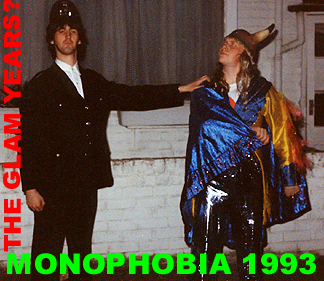 Monophobia started life in Watford as a joke within a joke... a spoof band created to appear in a surreal student comedy video (VDTV) by Phil Quinton in 1992. Phil needed a musician to help him record record the Dury-esque classic Boogie Your Bum Off for the short film. 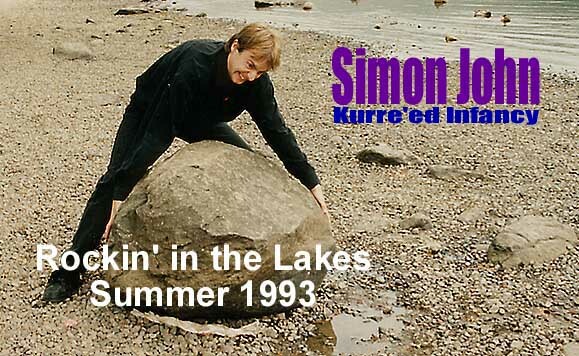 He had already recorded an untitled instrumental piece earlier that year (later entitled The Architectural Cacophony) with Bryn Rosenwould; a bizarre screaming alcoholic Stones fan from North Wales. 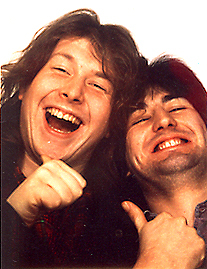 The new comedy track quickly became so popular that Phil and Bryn spent every night for a week in the college recording studio banging out dozens and dozens of cassette copies to sell to other students or exchange for beer in the pubs of Watford. 10 years later, the Boogie Your Bum Off video was broadcast on Channel 4 Television! In the beginning there was... Kurre'ed Infancy? 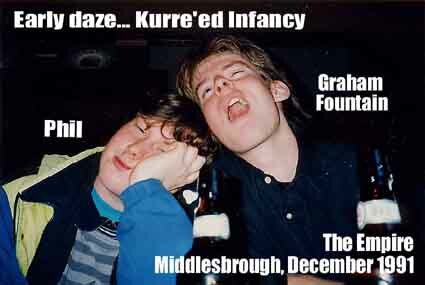 The roots of the project lie in the grave of a stupid talentless punk/metal band from Middlesbrough called Kurre'ed Infancy, which was started sometime around 1990 by Douglas "D" Mented a.k.a. Simon John (vocals and guitar) and Fred "Sicky" Hampton a.k.a. Phil Quinton (drums and shouting, later bass) with Graham "Shaky" Fountain later joining in guitar and vocals and Simon's girlfriend "Sticky Nicky" taking over on drums. Songs included such gems as Picking Your Nose, Edna (an instrumental thrash which ends up with Simon screaming "EEEEHHHD-NAAAAAA!") and a song called C (the chord C thrashed out rhythmically with the band all chanting "C!" every couple of bars). Some rough rehearsal tapes still exist somewhere. The band logo was designed as a pastiche of a labelled curry tin but with a picture of a foetus on the front. (Curried Infancy.) The band once played to an audience of two people in a church hall in Eston, where their music was deemed "ungodly" by the encumbant vicar and the band were banned. Sicky/Phil had written a song called The Ballad Of The Fried Egg Sandwich which was to be recorded in Watford by Kurre'ed Infancy for VDTV in 1992, but Douglas/Simon couldn't make it down from Middlesbrough in time so an alternative group had to be set up and a new song written - Boogie Your Bum Off! Names like The Deaftones and Tonaphobia were briefly toyed with for the new band to indicate tunelessness and ineptitude (The Deftones were unheard of in 1992), but Monophobia was chosen because it sounded cool at the time and nobody knew what it meant other than "fear of early Beatles records" (VDTV). Boogie Your Bum Off got remixed late in 1992 by Joseph Kane of tragically unsigned pop band Blue Innocence (who split in 1994). In 1993/94 Phil produced an album for singer/songwriter David Soakell to raise money for the Romanian Children's Hospice and the Christian Friends of Israel. (By now he had stopped using "Sicky Hampton" as a stage name.) 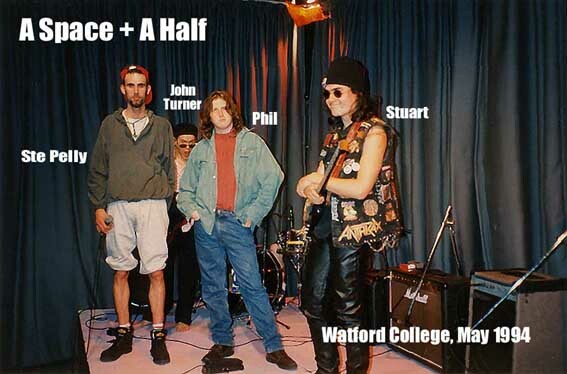 He briefly joined student rap/rock band A Space And A Half (formed by Stephen Pelly and John Turner in 1990) as a vocalist in 1994 shortly before the band split. 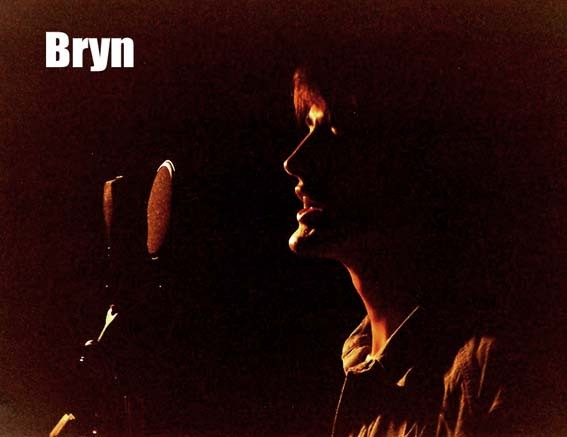 Phil and Bryn continued to record stupid and/or slightly corny songs until the end of their college course split them up in 1994. Tony Longworth's first band had been Form Field - later known as River's Edge - in 1991 with a brilliant bassist called Baha and John Mortel on guitar. Unfortunately the band never managed to find a permanent drummer and the bassist was becoming a bit too brilliant, cluttering up the songs with too many noodling bass solos and the band split early in 1994. Tony and John got back together later that year as The Honeymoon's Over with John Gaine on drums and a bassist called Rob. They recorded a brilliant demo. However at the end of the year, returning from a trip to Ireland, Tony found that the band had split in his absence. John Mortel had apparently found his Yoko Ono and left the band in disarray. Tony spends 2 years in creative limbo at this point involved in a bad relationship.